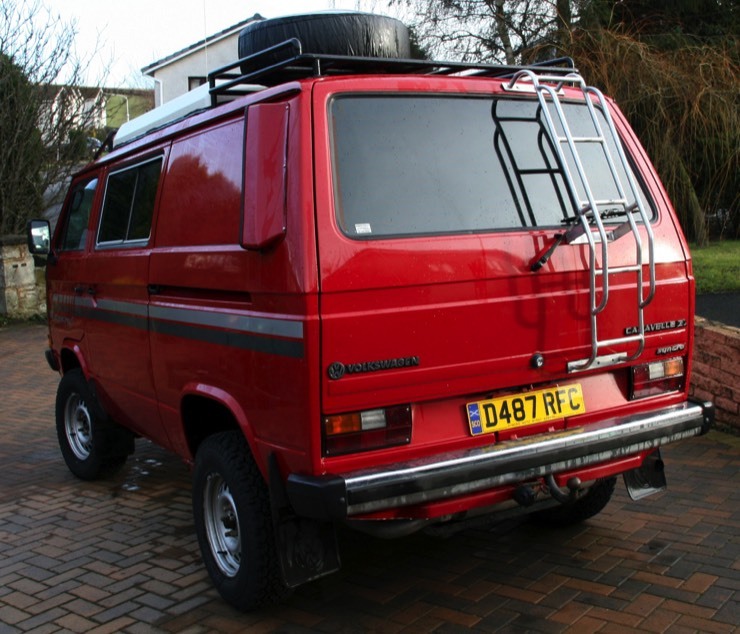 This Syncro was subjected to a complete restoration. 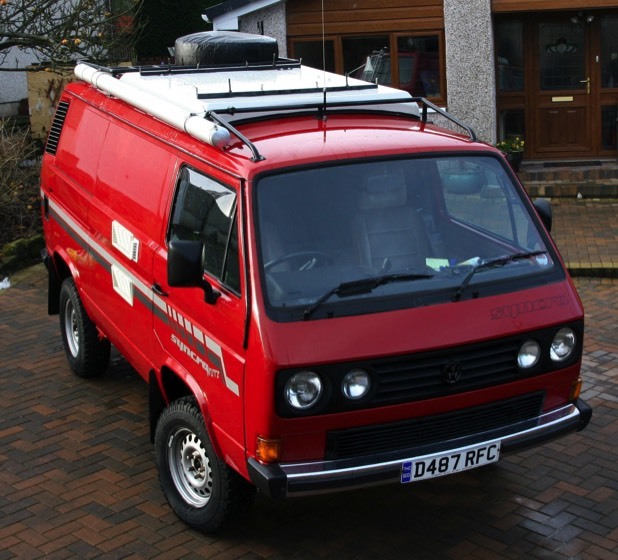 It was been upgraded from a standard syncro to something even more capable. Not only has it seen a complete bodywork restoration but has also had a complete suspension rebuild, along with a modified front-end and lift kit. The van is powered with a mechanical 1.9TDi engine setup complete with an external oil cooler and intercooler. The TDI was put in this year by Syncronutz and has improved the performance to no end. MPG is better and it drives without labouring. The attention to detail on this van is fantastic, with all key items powder-coated, all underside and interior panels waxoyled. A versatile camping interior and practical roofracks. Syncros are often seen surprising other 4x4 owners and drivers, with excellent 50/50 weight distribution and the front and rear difflocks they are very capable, in fact they are often found surprising the driver as well! On top of the overall improved ground clearance and larger tyres - the front end of this vehicle been improved dramatically for offroad performance. You can hardly see the modifications until you stand it next to a standard syncro. The angle of approach has been increased by moving the front bumper inches back and up - reducing the achilles heal of the Syncro - the front overhang. 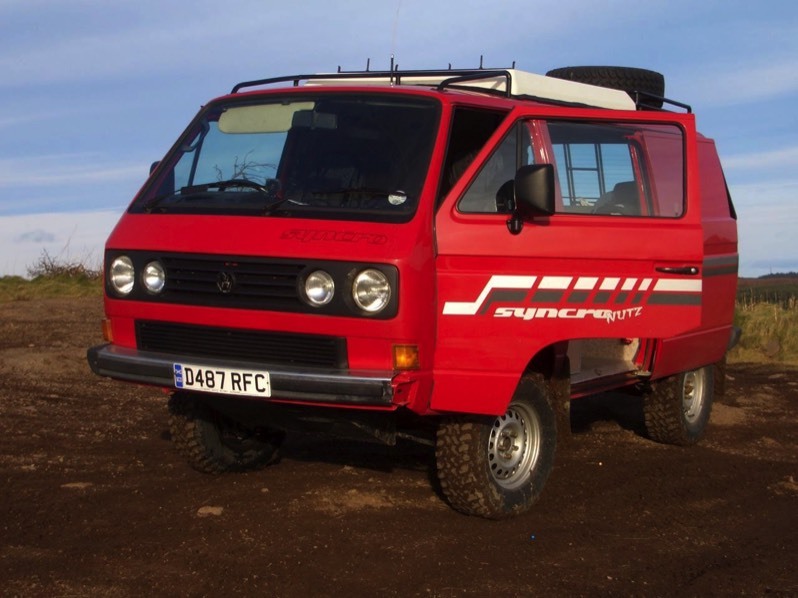 This syncro is not only fun offroad - with a luxurious GL spec interior and a full width bed I can sleep comfortably in the insulated and blown air heated interior. The pop top roof gives a full height walking space for cooking on the dual burner stove and a 45l 3 way fridge for food (or beer) storage! Suspension parts - stripped, shot blasted and powder coated. Skid Plates - stripped, shot blasted and powder coated. Lift Kit - raised by 2"
Body stripped to shell and rebuilt with rust treatment in all vital areas. Sliding Door now has a window. Resprayed in 2006 - couple of spots showing signs of rust but very minor. One key fits all locks - no key lottery!